Sometimes your phone gets too laggy to be usable and you just want it back to the state when it was new; or you just forgot your password. In the case on an OnePlus One, you hard reset it. Here’s how you can hard reset your OnePlus One. Turn off your OnePlus One completely and wait for at least 10 seconds. Press and hold the VOLUME DOWN and POWER BUTTON simultaneously until the phone vibrates. Tap on WIPE DATA/FACTORY RESET. Tap on YES — DELETE ALL USER DATA. Tap on WIPE CACHE PARTITION to clear up any data remaining on your partition. Select REBOOT to restart the device. When reformatting and resetting was successfully completed, set up your OnePlus One. Click the button to learn more about the features of the new OnePlus One. 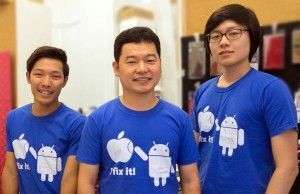 Let the Sydney CBD Repair Centre Team help you reset your OnePlus One! We specialize in Screen Replacement services.